1) Open up your Google AdWords account and open your Account if it is linked to a MCC. Notice all the tabs in your account and click on the Ad Extensions tab. If the Ad Extensions tab is not visible, use the little “down arrow” at the right of all the tabs to add it to your default tabs. 2) In the View dropdown menu (left), click on it and select Call Extensions. 4) And that’s it. 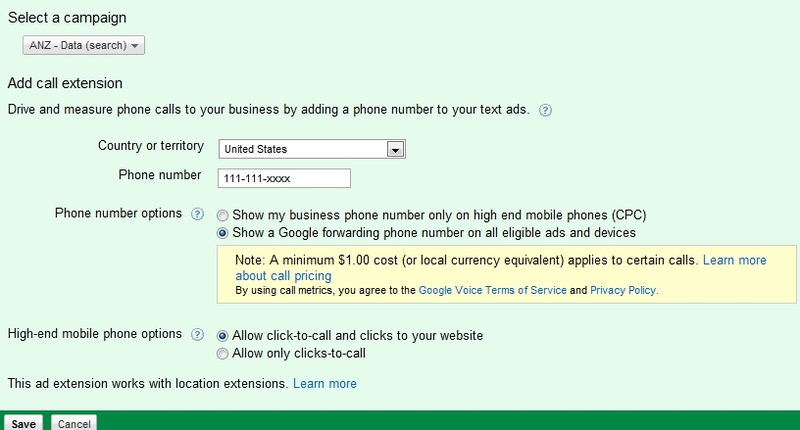 Your Adwords ads will start showing ads with a toll free number. Note the number you entered above won’t be displayed in the ads which is a good, because even if you put your cell phone number it won’t be displayed to thousands of people searching on Google everyday. Instead Google will generate a toll free number and show it and will forward users who call in to the number you enter above. If you have any questions relating to the implementation of this feature please leave a comment below. If you would like help from a certified Adwords professional, send in your request to adwords@simplylikeit.com.